Junto March Madness Final Four! The road has been long and the competition fierce, but the voters have spoken. Four worthy digital projects have made it to the final four of Junto March Madness 2019. Many of our matchups have been close this tournament, including one tie, but it was nevertheless stunning to see one result in the elite eight decided by a single vote. That speaks to the strength of this field, as well as the importance of your vote in the matchups below. Voting will end on Friday at 5:00pm and the championship matchup will begin on Monday morning. Remember to join the conversation on twitter with the hashtag #JMM19. Junto March Madness 2019: Elite Eight! This is the elite eight. We began this tournament with eight different “regions,” based loosely on the different kinds of digital projects nominated. The digital projects below have each won their “region.” The winners in this round will go to the Final Four. Thanks to those of you participating in the votes and on twitter (with the hashtag #JMM19). As always, we encourage you to explore these digital projects, rather than voting for the ones you are most familiar with. The field of early American digital history is incredibly rich and invites continued investigation. Junto March Madness 2019: Round 3! Round 3: the part of the tournament when things start to resemble an early American election. Corrupt bargains will be struck, defense pamphlets composed, and votes will be bought. A duel or two is always possible. Junto March Madness 2019: Round 1 Winners and Round 2 Voting! 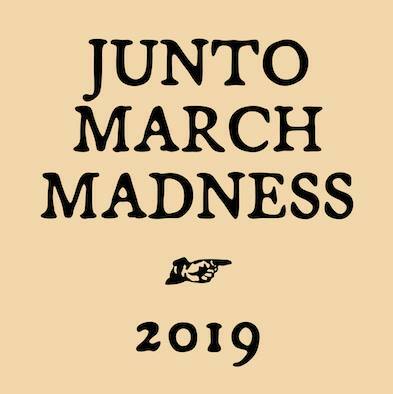 After some unusually polite trash talk on twitter, a first-round runoff, and more than three thousand votes cast, we are ready to move on to the next round of this year’s Junto March Madness tournament. Sadly, many worthy digital projects must end their tournament hopes today. We encourage you to revisit the entire field to appreciate the remarkable online resources available to those of us interested in Vast Early America. Today, voting begins for our tournament’s round two. It will end on Tuesday at 8:00pm (EST). Thank you to all of those who nominated digital projects and those who voted. We are gratified to see that many people are finding new digital resources, or even teaching with them, through this tournament. Remember, as always, that this tournament is meant to be a fun way to highlight some of the early American community’s favorite digital projects—rather than a serious attempt to identify the “best” digital project. As you vote for round two, we again encourage you to explore some of the projects you aren’t familiar with. Tell us what you’re finding and how you’re making decisions in the comments below, or on twitter with the hashtag #JMM19. Junto March Madness: Round One Runoff! Round one voting has finished for our 2019 March Madness tournament! Well, almost. The matchup between 2-seed Slave Revolt in Jamaica and 7-seed Magazine of Early American Datasets ended in a tie, and so we go to a runoff. Cast your votes below. This poll will only run for 24 hours, so make your selection quickly! We will announce the winners and begin round two voting on Monday.